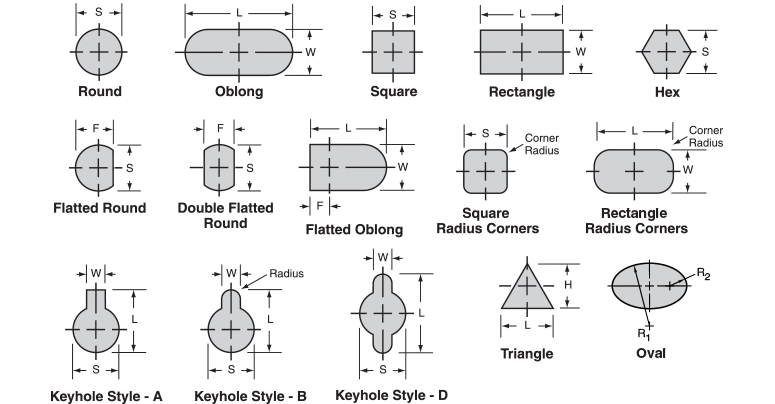 American Punch manufactures a wide range of punch and die shapes and styles, which we can modify to meet your needs. We have the expertise and experience to provide the right punch and die for your application. Please refer to the illustrations below when placing your order. Our sales expert requires the size, style and shape of the punches and dies you need to place your order accurately and efficiently. Not sure which punch or die will work best for the job at hand? Contact us now to speak with a knowledgeable sales person for assistance. We offer same-day shipping for stock dies and punches, as well as next day shipping for non-stock items. For square and rectangle punches: The "D" dimension is larger than the "S" dimension of the square and larger than the "L" dimension of the rectangle. The "D" dimension must not exceed the body diameter of the punch or the bore diameter of the coupling nut. Check with your salesperson for possible modifications to accommodate oversize tools by calling 800.243.1492 or submitting this short form.